One of the most annoying things lately has been this rush of pressure to be thankful. Check Facebook and Twitter; people are grateful for everything from the soldiers fighting wars to the crust on their homemade apple pie to the Midol relieving their cramps. Am I not thankful, you ask? Oh, please. I spend almost every minute of every day being thankful. I’m still stunned, sometimes, to realize that I am happily married and have incredible children and great friends and a nice house and excellent health. Part of me fears one day I will wake up and realize it’s all been a dream and I’m actually some big fat lady with lice who can’t get off the couch because even if I did I couldn’t fit through the door and I have 100 cats, like on Hoarders, and they crawl all over me all day long. And I really don't like cats. So yes, I’m thankful, but always, not just today. 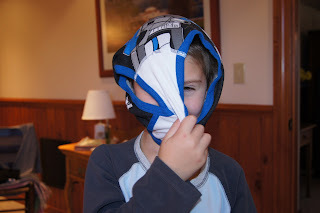 I’m thankful Jack still thinks it's funny to put his Star Wars underwear on his head. I’m thankful my mother-in-law caved and said we could eat Thanksgiving dinner earlier than the usual time of 7:00 pm, at which time my children are about to fall asleep in their mashed potatoes and everyone is drunk from six hours of cocktails. I’m thankful for Al Roker and the Macy’s Thanksgiving Day parade. I like him. He is funny and sharp and I like the way he dresses. And I’m happy for him that he lost so much weight. And the parade...well, it's just Thanksgiving. It always has been. I’m thankful for Twitter. I love Twitter. It’s like walking around at night and looking in lighted windows and seeing what people are doing. How else would I know Katie Couric is eating creamed spinach and sweet potatoes? I’m thankful that my husband’s iPhone is a wireless hot spot and can give him a wireless connection anywhere, even on top of a mountain, which is where we are. I’m thankful for sales, because as I’ve gotten older I’ve been afflicted by this weird and totally satisfying desire to save money. I used to get the same rush from spending $300 on shoes so my husband is much happier with the new me. I’m thankful I don’t have cancer. Yet. It scares the crap out of me. I'm thankful for Jack's placecards at dinner tonight...particularly the one for "Ant Dale." I’m thankful I like to read. I’m thankful I started this blog and I am so, so thankful every single time someone tells me they think it’s funny or interesting because you have no idea how good it feels to do something I love and actually be able to entertain people. So I’m thankful for you. And, yes, I’m thankful for wine, a glass of which is waiting for me right now. Hope you all have a very relaxing, very entertaining Thanksgiving weekend. It would be easier if Santa went on strike. Nine. It’s the new sixteen.